As the founders of Fille et Fils Scent Therapy say, “The nose is a terrible thing to waste.” Trisha Salvador-Ocampo and Tricia Chiongbian-Concepcion have one thing in mind when designing scents. They think only of freshness. Beginning with their first three Eau de Toilette sprays (Php 698/bottle) called Julien, Philipe, Cristiane — now under their “classic” line of unisex scents — the two moms only use natural oils from France, and they always strive for simplicity, like the freshness of morning dew, sweet fruits, and their favorite, a newly bathed baby. She sent me some to try-the Julien the Cristiane and a limited edition Anouk . I had to admit I first liked the Julien, which was instantly invigorating and not overpowering, and yes, it did smell rather, if in a word, refreshing. The Cristiane was a little bit heavier, maybe masculine and I wasn’t too keen on it. Anouk though, was most intriguing as I couldn’t determine what it reminded me of, but I liked that it wasn’t strong either and since I was on my way out, I actually sprayed a lot of it rather absentmindedly on myself as I rushed out the door. Friends at brunch and even a colleague at work later that day both remarked that they liked how I smelled. Ok, maybe those weren’t exactly their words but in essence they were asking what cologne I had put on that morning because they thought it suited me. Within 24 hours Anouk had made a decision for me, she was a definite keeper. 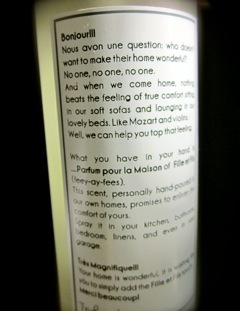 If you’re in the market for something that can make you feeltoulous frais-always fresh then get a whiff of Fille et Fils (translated as daughter and son) Scent Therapy. 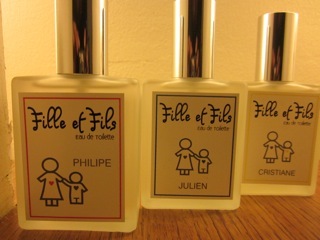 Fille et Fils offers other types of sprays, including home and linen sprays, insect repellants, and Eau de Colognes specifically for feminine tastes called Sabine, Solaina, Renee, and Anya. 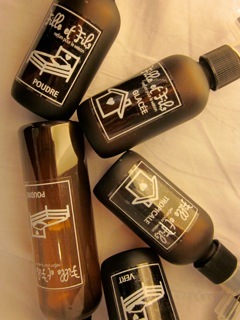 This Girl Flower Power line is available at Tarte Tatin in Powerplant and Greenbelt 5. Another retail outlet that carries Fille et Fils is G-Stop, which has branches in Greenhills Bridgeway and Alabang Town Center.For more information, please visit their website http://www.Fille-et-fils-scent-therapy.com or like them on their Facebook fan page: Fille et Fils Scent Therapy.